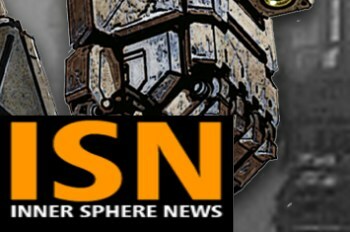 Attention Mechwarrior fans: the Inner Sphere News network is on the air! Does the thought of giant robots battling over the crumbling remains of an interstellar empire in the 31st century send a chill up your spine? Are you on Twitter? If you answered "yes" to both those questions, then may I humbly encourage you to turn your attention to the Inner Sphere News, a brand-new Twitter feed that bills itself as "THE source for Inner Sphere news." The ISN launch was followed almost immediately by a report of a "fragmented message" from Independence Weaponry on the world of Quentin. The fragment is part of an image, presumably of some sort of battlemech; two more fragments have since been decoded and released, while a fourth will be put out once the ISN has 450 followers. It's all rather cryptic so far but I don't think it's too much of a trick to figure out what's going on, or at least why the ISN is so suddenly on the air. Last week, Russ Bullock of Piranha Games provided a long overdue update on the status of his studio's Mechwarrior reboot, asking fans to hang in and saying that "it may be another month or so." And what is "it?" Nobody knows! But Bullock has also been retweeting ISN updates; it was through his feed that I became aware of it in the first place. So while "it" remains a mystery, it's looking pretty cool at this point. Keep up with all the latest happenings in the Inner Sphere, or at least one little part of it, on the ISN Twitter feed, @InnerSphereNews.